This is a sight word activity I put in my Word Work centers for Daily 5. I laminate the page and hot glue it onto a cookie sheet. Then children can place a sight word card on the "say it" portion. They "build it" with magnetic letters. Then they write it with a dry erase marker. This has been a great resource for my children. It makes them practice their sight words in three different ways. 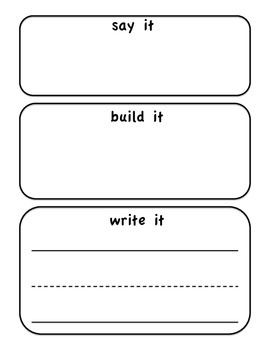 This can also be laminated and used with different materials to build words (wikki sticks, playdough, letter beads, etc.) You could also use this without laminating. It lasts longer if you laminate it though.